No matter where you stand in the political spectrum, if you work in the government you are surrounded by uncertainty and ambiguity. 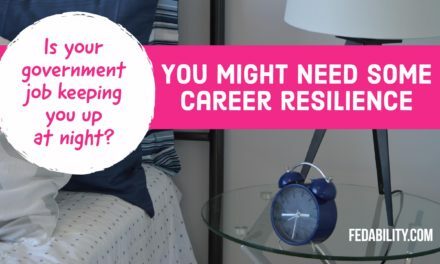 And it’s no wonder why you might be seeking an answer to the question: What is resilience? Is it just another word for happiness? Can it be learned? Is it just another fad? Take just a few of government employee worries. Will there be mass layoffs or reductions in force (RIFs)? Will our agency remain without a formal leader? Are we facing another shutdown in October? Are changes in government benefits going to further delay retirement? Will my agency be eliminated altogether? Is resilience just another word for happiness and optimism? To answer this, let’s look to their definitions. 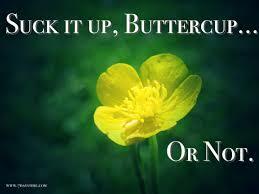 Most definitions of resiliency include something about bouncing back after suffering a setback. Or, it mentions the ability to recover quickly. Happiness is often defined as finding contentment and having a sense of well-being. It’s a state of having positive emotions. Meanwhile, optimism is looking for the positive in a situation and a general belief that things will work out as they should. 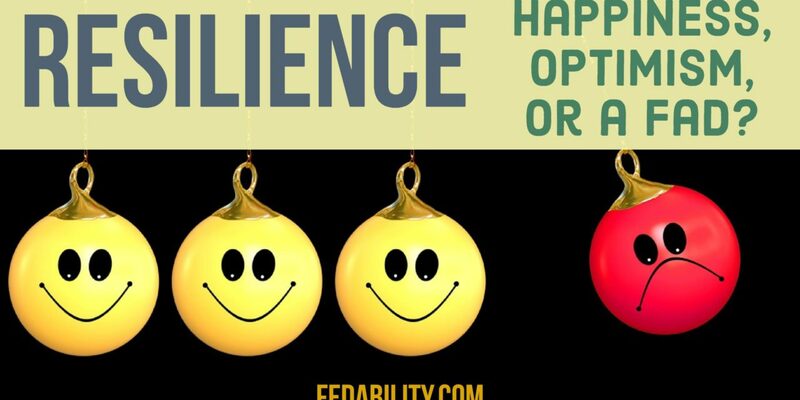 Looking at those definitions, you’re likely to see that while they have some similarities, happiness and optimism are in fact quite different from resilience. 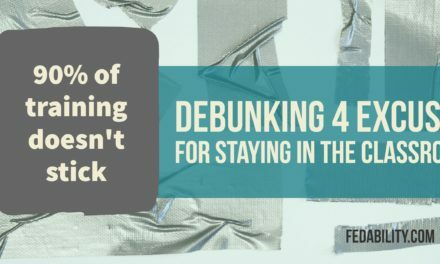 To assume that when someone undergoes a setback they should bounce back to they way they were before assumes there is no value to the setback. Arguably, set backs are an opportunity to learn and adapt. 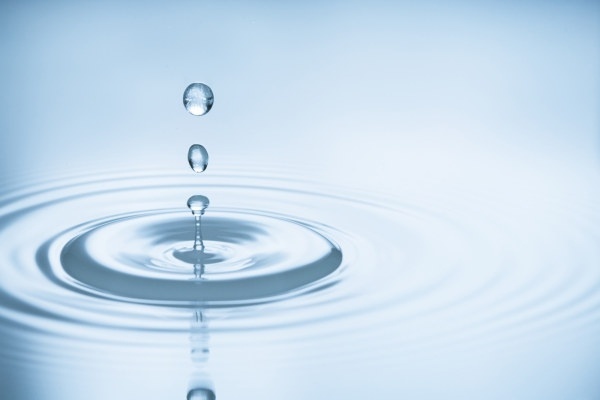 Imagine a rain droplet that encounters the surface tension of a puddle. Do we expect that it will bounce off the puddle and return to its cloud? The rain drop adapts. It changes shape. It tries again. And, eventually, it becomes part of the puddle. 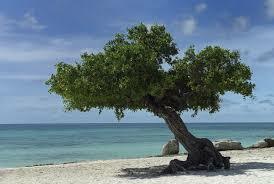 Or, let’s consider the divi divi tree of Aruba. Despite being a Caribbean island, Aruba is not the lush green island that one might expect. Instead, it’s actually got a desert climate with constant strong trade winds. As a result, the plants and animals that have called the island their home have had to be resilient to the unforgiving environment. In the case of the divi divi tree, it is not waiting for the wind to stop blowing. It is not fighting against the winds the sweep the island to stand tall like other trees. Instead, it has adapted by growing with the wind. It has adapted in a way that allows it to survive. I doubt anyone that looks at the divi divi tree thinks it’s given up or sold out. That it is unhappy or pessimistic. It has instead learned that if it wants to accomplish it’s goals (i.e., living) it needs to find another way. I don’t think it is. I think that the need for it has become more socially acceptable to discuss. No longer do we require people to suffer in silence. Nor should we expect that people will bounce back to the status quo. I’d argue, that resilience is coming to understand the current reality and finding ways to adapt to that new environment. That we must remain optimistic that we have it within ourselves to find a new way to grow. And, when we find that new way, that our happiness and sense of contentment will return. Just as the divi divi tree is content to be some of the most unique trees in the world. So yes. We may experience layoffs or go through another government shut down. Our benefits may change or be cut. Do we curl up in bed and allow the world to crumble around us? If we are to be resilient, we must consider the rain drop and the divi divi tree. How do we adapt? 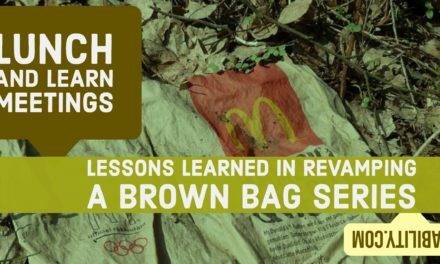 What will we learn from those experiences? How do we grow and survive despite the harsh environment? If you’re looking for ways to be happier at work, consider joining our 20-day Happiness Challenge. Lunch and learn meetings: Should we stick a fork in them? 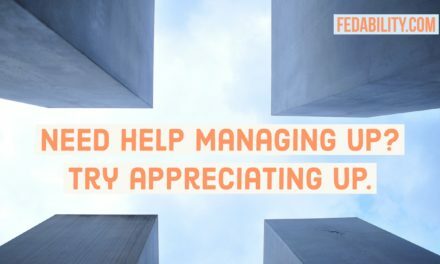 Need help managing up? Try appreciating up.